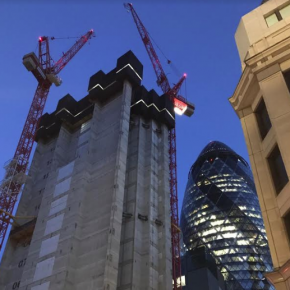 The building, which is being developed by TH Real Estate and constructed by Mace to a design by Foggo Architects, neighbours the Gherkin tower. When completed later this year, the iconic structure will stand at an impressive 96 metres tall and 23 storeys high, with its unique shape specifically designed to allow for breathtaking views over the City. 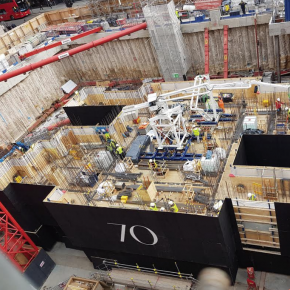 For concrete sub-contractors AJ Morrisroe, a vital requirement of the project was to source a concrete solution that would enable larger floor spans to be cast, with no compromise on the dead load of the overall structure. Crucial to guaranteeing the building is constructed in an environmentally-friendly manner, it was also vital all materials were as sustainable as possible. The natural choice proved to be Aggregate industries’ Lytag, a suremely innovative lightweight concrete solution with unrivalled credentials in terms of the construction of high rise structures. Up to 40% lighter than conventional concrete, Lytag was able to effectively reduce the composite deck concrete slab load by approximately 25% over normal weight control during the project, while offering the same level of structural performance. Furthermore, as a concrete made from secondary aggregate, Lytag has unique properties that can help substantially reduce the amount of natural quarried material required on a project; therefore making it a more environmentally friendly alternative to standard concrete. In total, Aggregate Industries has supplied 2000 cubic metres of Lytag to the project, which was instrumental in helping the tower recently receive an Excellent rating in BREEAM. What’s more, Aggregate Industries’ on-site inspector, who was present throughout the project, was consistently on hand to ensure the concrete pour ran smoothly and was successfully delivered on time. Anthony Blair, project manager at AJ Morrisroe, said it was important that the 70 St Mary Axe project used a sustainable concrete solution. “We were delighted with the exceptional properties of Lytag, without which this project might not have been technically and architecturally possible. We were also impressed with the solution’s sustainable credentials and would like to thank Aggregate Industries for their excellent service, on-time deliveries and support throughout this development,” Anthony said.